There's nothing more frustrating than malfunctioning or broken office equipment. In today's fast-paced digital world, it's important to get things up and running again as quickly as possible if they become inoperative. This is particularly true in the case of photocopier and printer repair. There aren't many items that are more fundamental to a productive office environment than a high-functioning photocopier. So if your office is in need of a printer repair technician or a general printer service, it's important to know which questions to ask to ensure you get the right person for the job. We know that different workplaces have different needs, so it follows that not all printer repair companies are created equal. Some will invariably offer services that are better suited to your office than others. 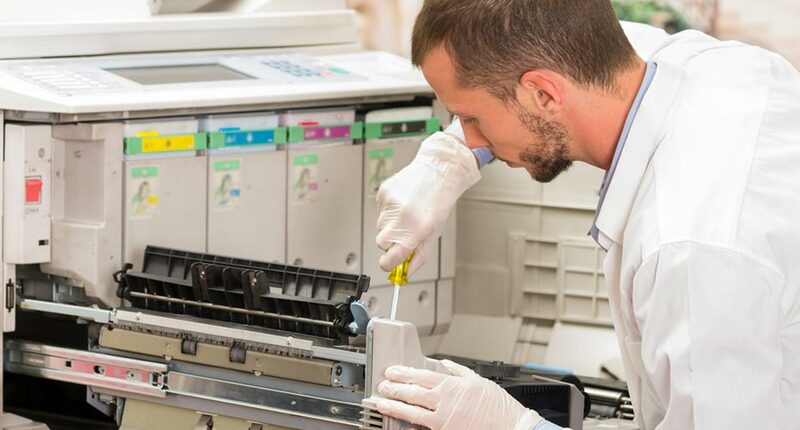 With this in mind, we've put together a list of the seven most important questions that you should ask a printer repair technician before you book them for a job, and why. We hope it will help you weigh up the best choice for you and your office so that you can get back to printing and copying documents without delay. 1. What is your call-out fee for printer repair? This is an important consideration - you don't want to blow half of the budget you had allocated to printer repair on a call-out fee! Make sure you ask the printer repair company that you speak to what their call-out fee for a no-frills printer service is. They should be able to tell you what the cost is with and without GST. For example, at Copysonic we charge $121, inclusive of GST, as our call-out fee. 2. If parts need to be changed and the technician doesn't have the part on him, is there a second call-out fee? This is an area where a lot of companies can be sneaky, and you can end up parting with extra moolah! Always ask if there's an additional charge in the scenario that your printer repair technician doesn't have the required parts on them and therefore has to come out to your premises a second time. On principle, we do not charge a second call-out fee at Copysonic in the unlikely circumstance that our printer repair technicians don't have the necessary parts in their toolkit on their first visit. We only charge for the parts that are required, too - we like to keep things simple, trustworthy and hassle-free. 3. Are there any other fees if the call-out takes longer than expected? This is an extremely important question to ask because as we all know, time is money. You want to go with a company whose printer technicians will repair your printer or copier properly without continually glancing at the clock - or worse, add insult to injury by handing you an extra bill at the end of the service. Our basic call-out fee of $121.00 including GST covers you for however long it takes to repair your photocopier - and that's a promise. We don't cut corners with our work at Copysonic, and we will never begrudge you an extra half hour (or more) of our time. 4. How quickly can you respond to a phone call requesting a printer service? Never make the assumptions that every printer repair company will understand the urgency of your request or the rush you're in to get your printer working again - make a point to ask how quickly a fleet of technicians can get out to you after you place the call! Look for a company that goes out of their way to minimise the wait time and spare you added inconvenience. At Copysonic, our response time is always within two hours, so we promise you won't be twiddling your thumbs for too long. 5. Is there a warranty on the printer repair work once completed? In addition to discussing the different options available for printer repair and service, you should ask the printer repair company you are speaking to if they provide a warranty after repair work is completed. This means that if your printer or copier starts acting up again, you won't get stuck coughing up even more of the office budget to get things fixed a second time. Printers are the unofficial workhorses of offices, especially for small businesses where one machine might handle every single bit of a team's paperwork. Look for a company that understands that you need enduring peace of mind and demonstrates this by providing a guarantee that your printer will continue to work efficiently once the repairs have been completed. For example, at Copysonic we provide a three-month warranty on every type of printer we service within the standard business workgroup. 6. Do your technicians have a thorough knowledge of different printer types? Printers and photocopiers are highly sensitive, complex machines with a lot of built-in features such as scanners, copiers and fax capabilities. You should always choose a printer repair technician who has a proven track record working in the industry and the in-depth product knowledge required to get your machine operating in top-notch order again. Everyone in our team at Copysonic started out as a technician, not a salesperson, which means you can rest assured that whoever we send out to repair your machine will know how to make your printer work seamlessly without stopping. Not every company or technician out there can offer quality repair service to your printer or copier, but we can. We have been servicing Australia's printing and copying needs for over 25 years, and we are known for our personalised and high-quality service. 7. Can your technician be easily contacted via office or mobile? After you place a call or submit a form requesting a printer repair job or printer service, it's natural that you'll want to be able to get hold of the assigned technician if you need to. Our printer repair technicians are easily contactable via mobile or by calling our main office in Huntingdale on [phone]. Since they're all specialists in printer repairs, it's likely that you'll have your machine fixed within a day. However, if you need to contact them before or after they arrive at your premises, you'll absolutely be able to. It's our responsiveness and fast turnaround time that makes us a favourite with customers around Australia. It guarantees you won't lose office productivity due to technical problems with your printer or copier, and makes the whole process as painless and hassle-free as possible. Next time you need a printer repair technician, we hope you'll keep these seven questions in mind. To chat with our friendly team at Copysonic, enquire online or call [phone]. Whichever brand or model you need to be repaired, you can be confident that the Copysonic team will be there to support you.